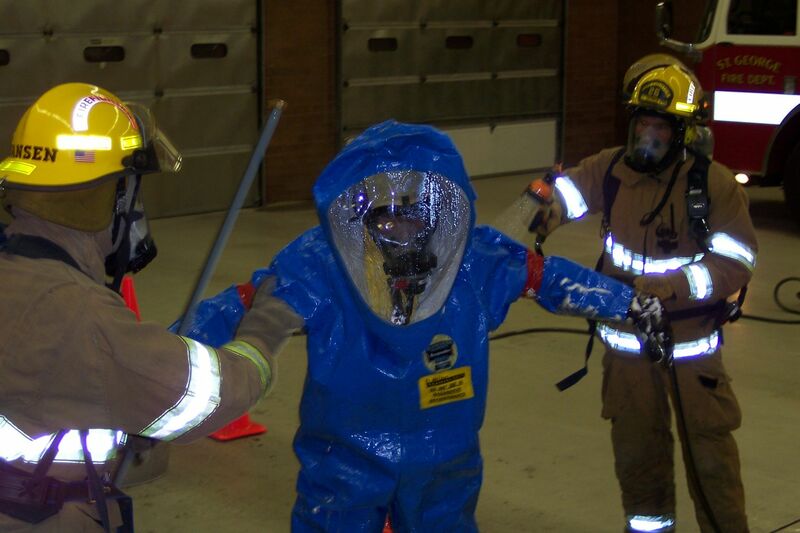 The St. George Fire Department is capable of handling a wide variety of hazardous material (hazmat) emergencies. Some of the emergencies we respond to include, but are not limited to: large transportation or industrial chemical spills, weapons of mass destruction, radiological emergencies, illicit laboratories, and biological hazards. Our department has 11 state-certified Hazmat Technicians that are trained in offensive strategies that stabilize hazmat emergencies. We also have 75 state-certified Hazmat Operations Responders. These responders are trained on defensive strategies that contain and isolate hazardous materials. We have a heavy rescue vehicle that is equipped with the necessary equipment for long term hazmat emergencies. We also have an enclosed trailer that is equipped with specialized decontamination tools and protective clothing. In addition to covering our city, the St. George Fire Department hazmat team also trains and responds with neighboring fire departments to cover all the hazmat emergencies in five counties. This groups is known as the Southwest Regional Response Team, and is funded by the county through national grants. St. George hazmat operations are coordinated by Captain Brad Esplin.